Prostaglandin E synthase (or PGE synthase) is an enzyme involved in eicosanoid and glutathione metabolism, a member of MAPEG family. It generates prostaglandin E (PGE) from prostaglandin H2. 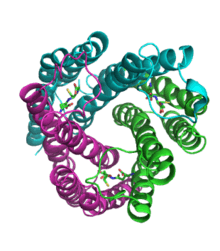 The synthase generating PGE2 is a membrane-associated protein. ↑ Jegerschold, C.; Pawelzik, S. -C.; Purhonen, P.; Bhakat, P.; Gheorghe, K. R.; Gyobu, N.; Mitsuoka, K.; Morgenstern, R.; Jakobsson, P. -J.; Hebert, H. (2008). "Structural basis for induced formation of the inflammatory mediator prostaglandin E2". Proceedings of the National Academy of Sciences. 105 (32): 11110–11115. doi:10.1073/pnas.0802894105. PMC 2516235 . PMID 18682561. ↑ Murakami M, Nakatani Y, Tanioka T, Kudo I (August 2002). "Prostaglandin E synthase". Prostaglandins Other Lipid Mediat. 68-69: 383–99. doi:10.1016/S0090-6980(02)00043-6. PMID 12432931. ↑ Park JY, Pillinger MH, Abramson SB (June 2006). "Prostaglandin E2 synthesis and secretion: the role of PGE2 synthases". Clin. Immunol. 119 (3): 229–40. doi:10.1016/j.clim.2006.01.016. PMID 16540375.